Talk about the ones that got away. This one never got got. October 24, 2017: It was a really big fish. Really. Certainly my biggest of the season. I don’t know exactly how big. I didn’t measure it or weigh it. Fact is I didn’t land it. But I didn’t have to. I know it was a bigg’un. There’s other ways to tell, you know. 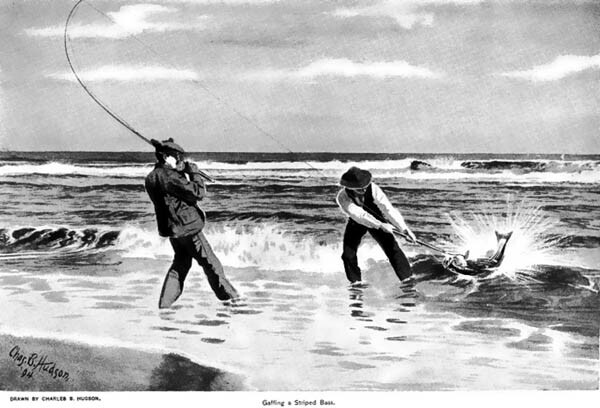 The fight of the fish, or the bend in the rod, or the pull on the line. But that wasn’t my measure. Not that I lost it or dropped it or had it break off. This really big fish, I mean. No, that wasn’t it, because I didn’t ever have the fish on the line. MY REALLY BIG FISH: If I drew a picture, it would look like this. You see, I never really hooked this really really big fish. But I saw it. It came up for my plug. It bumped my lure. It came out of the water. Almost. Its tail did. Its really big tail. I didn’t literally see this really big fish’s big tail. But I saw the splash that it made. It was a really big splash, from a really big fish that I didn’t see or hook or catch. I was with two fishing mates at Shagwong Point when I didn’t catch this really big fish. They didn’t see it. They were busy casting in a different direction. But I called out to them as soon as it happened. “I just had a really big fish come up!” They nodded their heads in acknowledgement. We all kept casting in hopes that it would come back. Or that this really big fish was swimming with other really big fish nearby. But, it was gone. That happens. Especially with really big fish. My buddy Verizon Charlie had a really big fish that he didn’t land or see earlier this year. Talks about it all the time. Knows exactly what it was and almost precisely what it weighed. VC is a really really good surfcaster. Now we exchange stories about our really big fish in ways not too many others understand. You’d have had to be there. Nothing personal. But it’s really really something special to not catch a really really big fish. An exclusive club, sort of. Wow. I’m gonna remember this fish for a very very long time. It was really big. Really. This entry was posted on Tuesday, October 24th, 2017 at 5:26 am and is filed under Uncategorized. You can follow any responses to this entry through the RSS 2.0 feed. You can leave a response, or trackback from your own site. Think it was the Loch Ness monster?